From USA Today bestselling author Tonya Kappes, comes a brand new hilarious and fun paranormal mystery series a bout Emma Lee Raines, a funeral home director who can suddenly see dead people! Bopped on the head from a falling plastic Santa, local undertaker Emma Lee Raines is told she’s suffering from “funeral trauma.” It’s trauma all right, because the not so dearly departed keep talking to her. 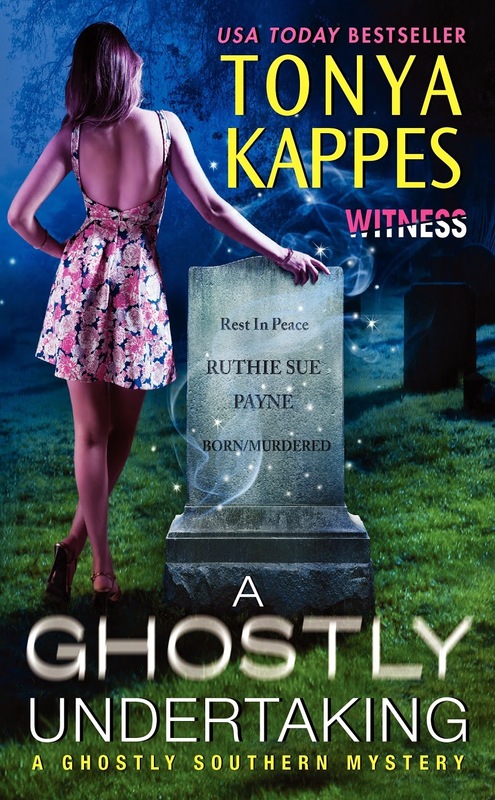 Take Ruthie Sue Payne--innkeeper, gossip queen, and arch-nemesis of Emma Lee’s granny-she’s adamant that she didn’t just fall down those stairs. She was pushed. Ruthie has no idea who wanted her pushing up daisies. All s he knows is that she can’t cross over until the matter is laid to eternal rest. In the land of the living, Emma Lee’s high-school crush, Sheriff Jack Henry Ross, isn’t ready to rule out foul play. Granny Raines, the widow of Ruthie’s ex-husband a nd co-owner of the Sleepy Hollow Inn, is the prime suspect. Now Emma Lee is stuck playing detective or risk being haunted forever. 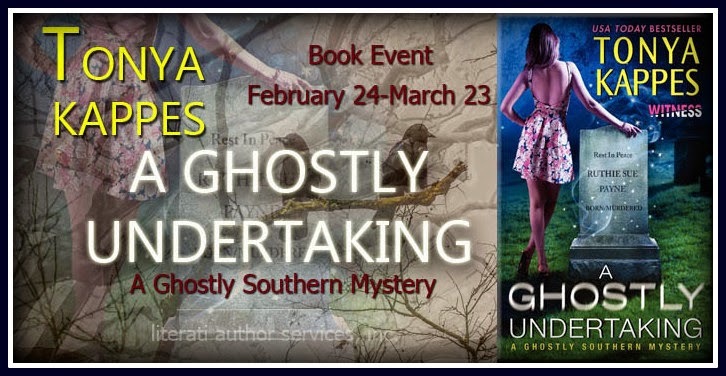 A GHOSTLY UNDERTAKING by Tonya Kappes was such a delightful cozy mystery. I love everything about it starting from the murder mystery, down to Emma Lee Raine's personal life! The case that is Ruthie Sue Payne's murder put Emma Lee in a tight spot. Not only is her grandmother one of the suspect in the case, her granny has been behaving oddly of late. Though Emma trusts her grandmother, she can't help but think that Granny Raine's knows more than she's letting on. So for most of the novel, I was flip-flopping on Granny. One one hand, the snotty Southern Belle seems above murder. On the other hand, she hates Ruthie and it looks like she's up to something that may benefit her immensely if Ruthie is out of the way. Emma Lee's weirdness. It's a small town and a lot of the residents are skeptical about Emma Lee's ability to see ghosts. So what does one do? Play it up and stay being weird! Speaking of Sleepy Hollow residents, they are funny and hella entertaining! It's annoying in real life, but on paper, all the gossping, posturing, petty rivalries and what-not had me giggle snorting continuously through A GHOSTLY UNDERTAKING. I love small-town cozy mysteries. It's easy/hard to be a sleuth when your suspects are people you've known all your life. On the same token, it's hard to keep secrets when the whole town is watching. The plot of A GHOSTLY UNDERTAKING is simple with enough complications to make the novel engaging. TKappes kept the tone light for the most part. TKappes didn't make a big deal out of Emma Lee's ability. I thought she's going to make things complicated by making a spectacle out of Emma Lee by making her a pariah of some sort because of her abilities. TKappes kept in on the DL, no dramatic revelations here as far as that is concerned. Instead, the emphasis on the drama revolved around Ruthie, Granny Raines, and the man they both shared. Darn it! I wish Earl Payne was still alive, I sure would've liked to see this old dude's smooth mooves! Romance was light and cute. Emma Lee and the Sherriff still has a long ways to go but I love a good courtship! Lastly, I was awe struck when the identity of the killer was revealed. Like literally. Hilarious! Emma Lee needs to grow more as a character. She might be the heroine of the novel but she wasn't the one steering the story, if you get my drift. I'm sure we'll see more of this growth in the next novel now that she knows her gift is legit and she's not crazy. Tonya Kappes has written more than fifteen novels and four novellas, all of which have graced numerous bestseller lists including USA Today. Best known for stories charged with e motion and humor and filled with flawed characters, her novels have garnered reader praise and glowing critical reviews. She lives with her husband, two very spoiled schnauzers, and one ex-stray cat in northern Kentucky. More than anything, Tonya loves to connect with readers, and has a ‘street team’ of fans and followers on social media. Be sure to check out her Facebook, Twitter, blog and newsletter! You are making me wish I would have requested this one! Darn it LOL! So glad this was such a great read! I loved weirdness, I love small towns, and I've been swearing for like a year that I was going to try some cozy mysteries, so I'm gonna. For real this time ;) Thanks for the giveaway! Start here! It's light, easy to read, not too serious. You can just sit back and be entertained. Okay, so this one sounds like fun. And curious about why the identity of the killer is hilarious to you. Lol. Want. Want. I wish I can say who! The final reveal had me in stitches not because of who it was but how it was revealed. It's appearance is just... OMG! Glad you enjoyed this one so much! Thanks for checking it out Christy! I just added this to the WL the other day. I'm so anxious to read it! Oooh can't wait to compare notes with you! this is one i am looking forward too. hopefully its still on EW. if no ill wait for it to hit amazon. it sounds pretty cool and fun to read. I saw someone else enjoy this one as well. I think I'm going to have to grab it. Grab it! Grab it! Grab it! Totally wish list here! You sold me. Love quirky small town characters and mysteries. Ohh sounds good. Small town mysteries with a paranormal twist and what seems like Sleepy Hollow references. If what I'm think it is . I'm definitely going to add this to my buy list . Thank you so much for your review! I'm thrilled you enjoy A GHOSTLY UNDERTAKING!! THANK YOU! And thank YOU for writing such a wonderfully entertaining mystery. You are making me regret not requesting this book. I'm glad that you enjoyed it SW. It sounds like a place/book that I would like to visit/read. I keep seeing good reviews about this one. I hadn't seen it until today. Definitely gonna need to try it. I really enjoyed this one as well, it was so fun and book 2 was the same so I'm glad to see you had a good time with it! Oh yay! thanks for the feedback, now I want to read it! Hahah gosh this one sounds so entertaining with the small town residents playing it up and the girl's ability to see ghosts! That sounds like so much fun! Great review, you make me want to pick this up. It's a good break from the usual paranormal books I read. it's light and funny! Oh, man, that is so true! I feel like small-town mysteries are far more itnriguing for the same reasons - that you know everyone and you can't keep secrets at the same time; the fact that someone else has done something sinister makes it so much more ominous. Glad that despite that though this was a very entertaining and humorous read for you! I kept imagining I was in my hometown in Bicol, investigating my neighbors whom I've known since I was a wee bebe. I like the fantasy very much!